12 August 1958 was the date when budding photographer Art Kane took the photo in Harlem that would, over the years, forever memorialise the spirit of jazz in truly iconic fashion. Against all odds, he gathered together 58 of the 'big beasts' and 'young lions' of the jazz world at a location in Harlem at 10am on that summer's morning - when many would normally would have played in to the small hours, and would have found the early start a challenge - and with the help of an equally inexperienced assistant, eventually assembled them on the steps of the brownstone to pose for that unique snapshot. 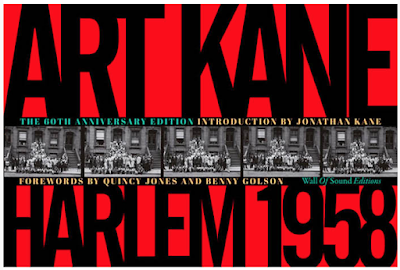 The background is that the new art director of Esquire magazine, Robert Benton, wanted to impress the boss, Harold Hayes - 'a big jazz buff', as Kane stated - so proposed The Golden Age of Jazz issue. Willing to take risks, he'd recognised Art Kane's potential, and wanted to give him a break, even though Kane was working as an art director with only a limited number of minor photos to his credit. 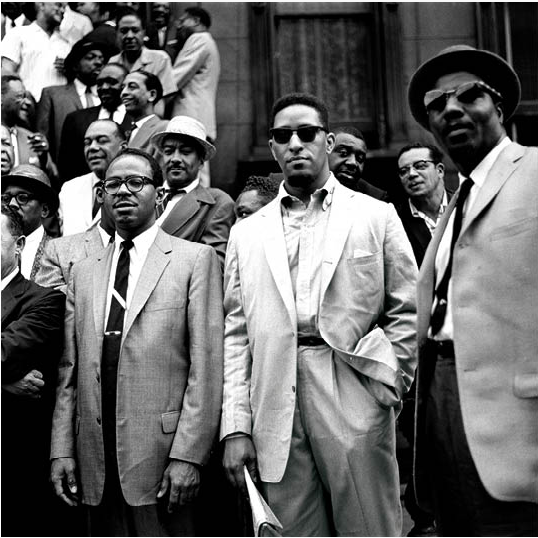 So Kane, also a jazz enthusiast, came up with the idea of a gigantic double page photo and set himself the daunting photography brief which would set him on the road to being one of the most significant photographers of the era. The issue, now a collector's item, was published on 1 January 1959 and included a wide range of jazz-related content, including a suite of Kane's powerful photos of Duke Ellington, Lester Young, Louis Armstrong and Charlie Parker's tombstone. In 1994, the documentary, A Great Day in Harlem, directed by Jean Bach, about Kane's photo, with its fascinating interviews with participants, won many plaudits including an Academy Award nomination. The new book, Art Kane: Harlem 1958, which focuses on this photo-shoot on its 60th anniversary, is published by Wall of Sound Editions, an imprint based in northern Italy and devoted to music photography. In its 168 pages the photographer's contact sheets and the individual frames from those film rolls are the heroes. With the images all reproduced as four-colour black-and-whites, the slightly antique, tonal consistency is expertly maintained by the printers, Grafiche Milani, and the broader story of the encounters and renewed acquaintances is revealed in close-ups of smaller groups as they coalesce and move around. There are decent forewords by Benny Golson, who points out that he and Rollins are the only surviving subjects of that memorable shoot, Quincy Jones (who was studying in Paris at the time) and Jonathan Kane, Art Kane's son, who offers some revealing insights - notably that there was a short-lived move to try an alternative location a few blocks down from 'the perfect location' at 17 E 126 St. There is a transcript of Art Kane's thoughts about the day, probably taken from Bach's documentary (Kane died in 1995) and potted biographies of each of the musicians present at the shoot. The book also dips in to Kane's photos for other related assignments - Harlem Soul, some amazing Aretha Franklin photos and stills for the film, Pete Kelly's Blues. However, for all its good points, the book falls short in various areas, in my view. The reader is presented with over 120 photos with no guidance whatsoever as to who is shown in each frame, so has to struggle, or give up trying, to identify the musicians in each frame, as many are not well known and recognisable, and all are off-duty, so in less familiar guises. Each photo should either have been captioned discreetly, or numbered with a link to a list that detailed the main subjects in each photo. The images are presented out of the order in which they were taken when compared to the contact sheets and, on close examination, are often slightly cropped. There is a strong case for leaving contact sheet frames entirely uncropped in this kind of context and for maintaining the precise order in which they were taken. It would also have been interesting to have considered reproducing these images as duotones or tritones, to give them an even more special feel, although they have come out very well. A rigorous, commissioned essay would have added gravitas to the book's status, and, given there are hints that much has been written about this legendary image, there is no bibliography to reference any articles, papers, books, or film documentary referring to this event. Esquire magazine’s The Golden Age of Jazz issue is not explored in any detail, nor its pages shown, apart from a cover and the photo spread, which has taken on an unattractive rosy hue. The Ellington shot is not shown (there is a great story behind it which could have been articulated) and those of Armstrong, Young and Parker's grave are not presented to show how they appeared in the magazine. There are typographic irritations, too - the line spacing within the text setting is inconsistent and uncorrected - notably in the Golson foreword - and there are some uncorrected typos and punctuation errors. Given that this is presented as a key book about this legendary photograph, it really does not have the content or rigour, apart from showing all the frames, to justify its status as being the definitive book on the subject. However, it has more than enough going for it to appeal to those who would like to experience the full visual content captured by Art Kane and the extraordinary ambience emanating from that momentous event.